Buccinator Muscle is the muscle of the cheek. The buccinator forms the muscular component of the cheek and is used every time air expanding the cheeks is forcefully expelled. It is in the space between the mandible and the maxilla, and is quite deep to the other facial muscles in the area. The buccinator arises from the posterior part of the maxilla and mandible opposite the molar teeth and the pterygomandibular raphe, which is a tendinous band between the pterygoid hamulus superiorly and the mandible inferiorly and is a point of attachment for the buccinator and superior pharyngeal constrictor muscles. The fibers of the buccinator pass toward the corner of the mouth to insert into the lips, blending with fibers from the orbicularis oris in a unique fashion. Central fibers of the buccinator cross so that lower fibers enter the upper lip and upper fibers enter the lower lip. The highest and lowest fibers of the buccinator do not cross and enter the upper and lower lips, respectively. Motor supply is from the buccal branch of the facial nerve (Cranial Nerve VII). Sensory supply is from the buccal branch which is one of the muscular branches of the trigeminal nerve (Cranial Nerve V). 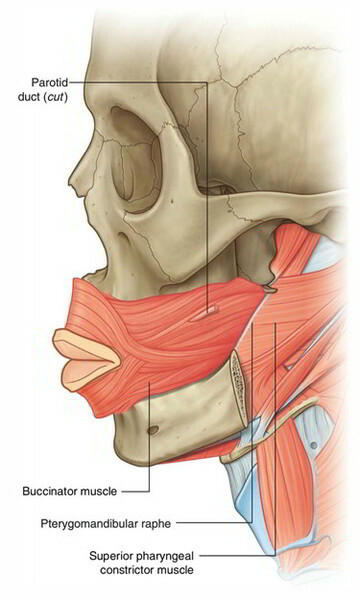 The Buccinator Muscle compresses the cheek against the teeth. This action is required during the process of chewing, when the food accumulates with in the vestibule of the mouth. It helps in sucking by compressing the cheek. Its action is required to blow the cheek. This muscle is covered by the bucco pharyngeal fascia and buccal pad of fat. It is pierced by the parotid duct. Contraction of the buccinator presses the cheek against the teeth. This keeps the cheek taut and aids in mastication by preventing food from accumulating between the teeth and the cheek. The muscle also assists in the forceful expulsion of air from the cheeks.